Photographing dogs for a living is a career that most could only ever dream of, but for David Darcy it’s all part of the job. We were lucky enough to recently interview the award winning dog photographer and get the low down on life as an Advantage A-Team Ambassador, being on the set of Red Dog and the secrets to getting that perfect shot! When did your passion for photography begin and have you always been drawn to photographing dogs? I have always loved dogs and photography, but there was a defining moment in 1999 when my dog photography career started. I was on a road trip testing out some new cameras and one cold morning in Toomba, NSW I was setting up for a landscape shot and my dog kept running through the picture. I grabbed her and sat her on-top of a big post to keep her out of the way and the moment I did I saw a wonderful picture of her sitting there with the majestic scene in the background. From that moment on I have always wanted to capture dogs just being themselves in the environment. What is the most challenging thing about being a dog photographer? The most challenging thing about being a dog photographer is the same as the challenge all photographers face. It's adapting to an ever changing climate. Digital photography and the internet have turned photography on its head. 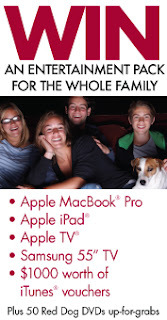 There is an endless supply of free photographic content for consumers nowadays. Everyone owns a good camera and posts their pictures, so you have to compete against a billion photos every day. Thankfully I've stuck with something I love and created a niche market early in my career, but I still need to evolve with the times and be as creative as I can every day. My new book due out in August 2012 is the biggest highlight so far. Since my first publication I have dreamed of having a big coffee table book that captures all dogs in all walks of life. Murdoch books have brought this dream to life and soon it will hit the stands. I'm beside myself with excitement. Tell us about your new role as an Advantage A-Team Ambassador? 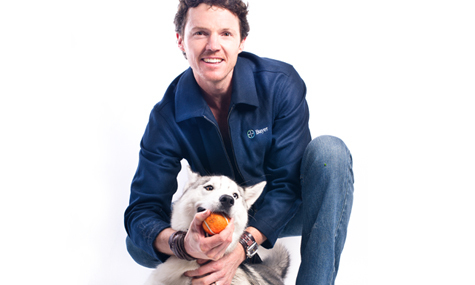 My role as an ambassador for the Advantage A-team is an opportunity to have my passion and commitment to my career and of course the subject (my pets) recognised, but more importantly it is a chance for me to help address animal health issues and spread the message that a healthy pet is a happy pet and a happy pet makes for great photographs. Animal health is extremely important. Good advice and taking preventative measures against your dog getting sick goes a long way in maintaining your pet’s health for life. Your own dogs are often featured in your work; did you have to train them to be good in front of the camera? Yes my own pets star in many of my photographs, but I have never trained them for it. Apart from sit and stay I pretty much just let them be themselves and run around normally. It's more about waiting for the right moment rather than trying to manipulate them into it. Tell us about your experience on Red Dog. Was it exciting to be working alongside Hollywood stars? Working on Red Dog was an amazing experience, but the glamour and excitement of lights, cameras and celebrities wears off pretty fast. When you've got a job to do, it's important to focus on doing it well. Movies only work if everyone works together. Red Dog was shot on location in 35 plus degree temperatures with lots of dust, flies and burning sunshine. It was hard work. But even though they were tough conditions we all had a great time and I was very lucky to spend a whole day with Josh Lucas and Koko the dog. That enabled me to get some really good close personal pictures. 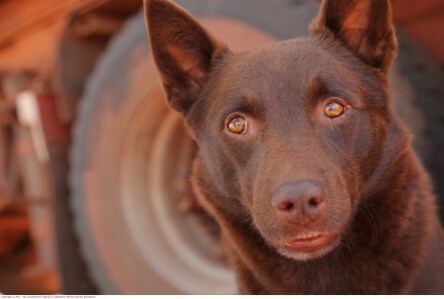 And of course it's been a buzz to see those pictures turn up in hundred, if not thousands of publications around the world promoting this wonderful Australian movie about this amazing dog. What advice do you have for any pet owners that want to snap that perfect photo of their furry friend? Patience, practice and perspective. I've been doing this for more than a decade and every dog is a new challenge. Patience is key to getting consistently good shots, you can't rush perfection. Practice again and again, and get used to your camera equipment. Things happen so fast with dogs and you need to be ready to shoot at a moment’s notice. And finally think about the angle. Don't just stand over your dog and snap away. Lie on the floor, put the camera on the ground, or chase the dog while you shoot they all make for a different perspective. If David Darcy got you excited about Red Dog, then you won't want to miss this! We are giving away 50 Red Dog DVDs as well as a family entertainment pack for the whole family. 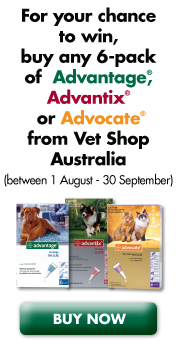 To enter simply purchase any 6 pack of Advantix, Advantage or Advocate from VetShopAustralia.com.au and you will automatically be in the draw! Pet photographer. What a great job! I'd love to do that for a living!